The doctor, known for his role as an addiction therapist on VH1’s Celebrity Rehab, said that after reviewing Clinton’s public health records, he grew concerned about the type of medical care she is receiving, describing it as antiquated, particularly for an elitist with strong political influence. Pinsky and his colleague agreed that Clinton should be receiving a higher standard of care after learning that the candidate is being prescribed medicine that was popular in the 1960s. “Both of us concluded that if we were providing the care she was receiving, we would be ashamed to show up in a doctors’ lounge. We would be laughed out. She’s receiving sort of 1950s-level care by our evaluation,” Pinsky stated on KABC’s McIntyre in the Morning show. “Pinsky said Clinton has received unconventional treatments over the years, calling the medical decisions ‘bizarre’ and speculating that it could be causing uncommon side effects,” Fox News is reporting. Certain of Clinton’s health records that have been made public reveal that she had two episodes of deep venus thrombosis, a blood clot usually occurring in the legs, as well as that she has been diagnosed with hypothyroidism, a condition common in women over the age of 60. The records show that Clinton was treated for the blood clots with an anticoagulant that’s rarely used anymore, said Pinsky, adding that a woman of her caliber should have been prescribed a newer drug. “So the very medicine doctors are using may be causing this problem and they’re using an old fashioned medicine to treat it – what is going on with her health care? Maybe they have reasons, but at a distance, it looks bizarre,” noted Pinsky. So far, the Clinton campaign has dismissed theories that the presidential candidate is in poor health, calling them nothing more than “right-wing conspiracies.” However, recent footage of Clinton requiring the help of three men to assist her up a small set of stairs suggest otherwise. 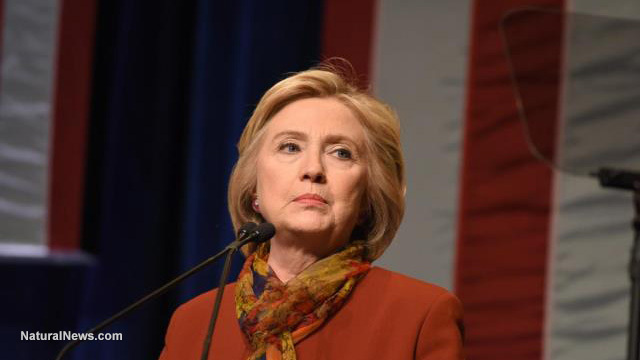 The conservative news publication reported in January that Clinton had suddenly disappeared from the debate stage, leaving some to speculate whether the presidential candidate had simply been on a bathroom break. However, “a law-enforcement source with inside connections is alleging that Clinton was missing from the stage due to health issues stemming from a previous brain injury. “These long-lasting symptoms stemming from a concussion and blood clot, according to a neurologist, suggest Clinton is suffering from post-concussion syndrome, which can severely impact her cognitive abilities,” Breitbart reported. Still, the Clinton campaign insists the candidate is in good health, and perfectly fit to serve as president of the United States.